There are now more than 1,000 Scout and leader members of SOSSI who collect Scout stamps. 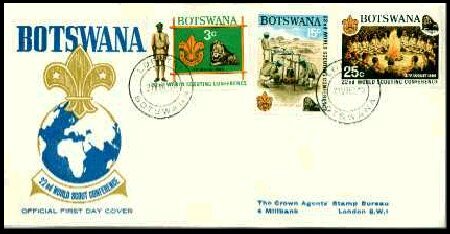 Most of these collectors also prefer FDC cacheted, if possible for each Scout stamp issued. The earliest Scout stamps of Czechoslovakia (1918), Siam (1920), Hungary (1925) and Romania (1931) had few covers on first day dates. Almost no interest in this colleting area was shown until 1937. At this time, the Netherlands and the Dutch East Indies issue FDC sponsored by the 5th World Scout Jamboree held in Holland, an airlines company in the Indies and a few individual designs. 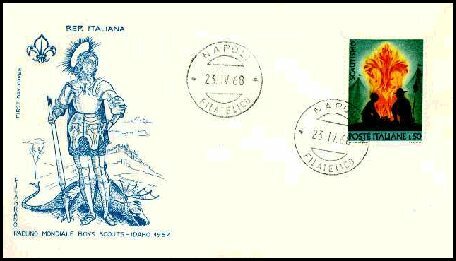 This handsome First Day Cover from Luxembourg honors Lord Baden-Powell and the Boy Scouts. 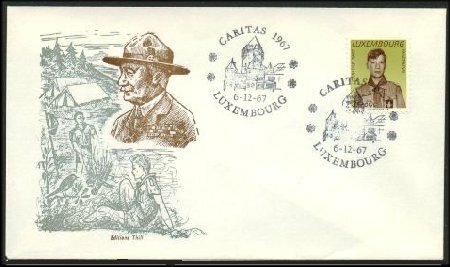 The stamp shows His Royal Highness Crown Prince Henri of Luxembourg in Scout uniform, while the cachet shows a Scout encampment and a portrait of Baden-Powell. 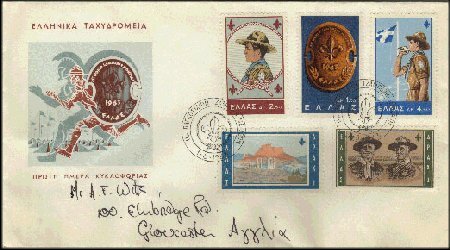 This first day cover has six stamps issued in 1963 for the 11th Boy Scout World Jamboree. The stamps are postmarked with a special cancel, showing the scout emblem, on the first day of issue of the stamps. The stamps have interesting scouting themes; all have the scouting symbol, and one shows Baden-Powell. The pictorial cachet on the cover is in Greek, and the address (to England) is in English and Greek. This issue from Italy honors the Boy Scouts. St. George and the dragon cachet are depicted. The campfire flames on the stamp rise into the sky and form the Scout emblem.